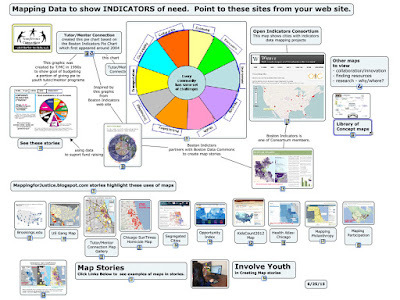 This map is a screen shot from the Community Commons resource center. 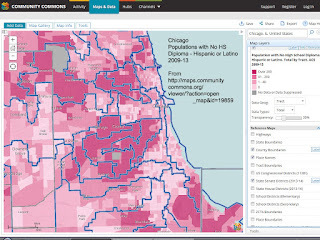 The map shows census tracts where a high number of Hispanic residents have not received a high school diploma. The areas with the darkest red are tracts with 200 or more people without a diploma. If you click this link, you'll find another map, this one showing 'racial/ethnic diversity. On this map I've also turned on Illinois state senate district boundaries, which can be used to hold elected people accountable for what they do to help the people in their district. I've a feature like this built into the Tutor/Mentor Program Locator, but the technology on this site is much more sophisticated than on my site. I encourage you to browse around the Community Commons map. You can look at other cities. You can zoom in. You can turn on different layers of information. It's a really good data site. Using maps like this, and maps that show services, like tutor/mentor programs, that might help young people stay in school and get their diplomas, or adult literacy/career education programs that help adults get a GED, or vocational skills training, could show where existing services are located and where more are needed. 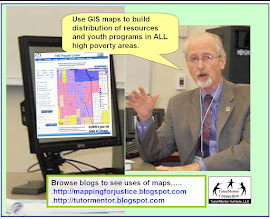 Browse articles on this blog, and here and here on the Tutor/Mentor blog that show how I've used maps in stories that are intended to motivate leaders to provide time and resources to support existing programs and/or help new ones grow where they are needed. Youth, volunteers, business and/or political leaders in any of these areas could be creating similar maps, for the same purpose that I do. 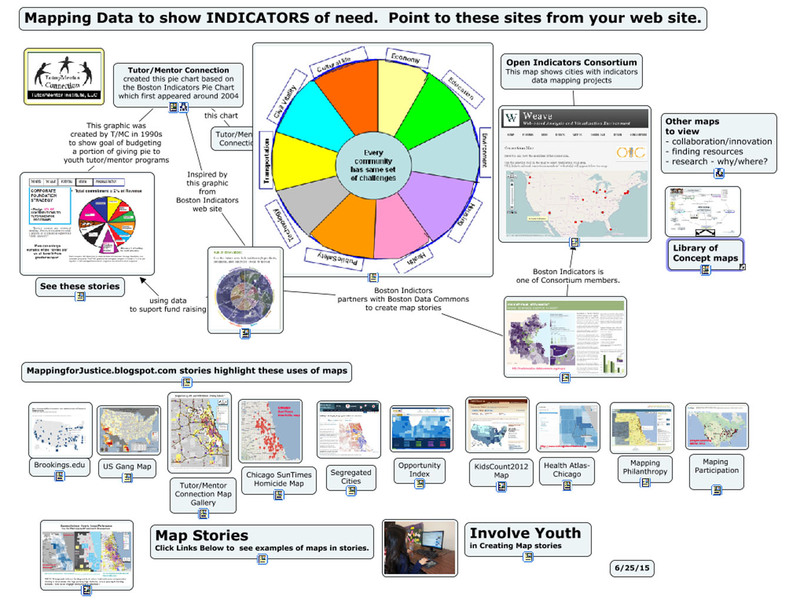 This concept map includes links to some of the data-mapping portals that are described in past articles on this blog. It will be updated from time to time to add links to new portals as they are discovered. I seek to be part of a network of data visualization and communications talent who will use this information to create on-going stories that draw more people, dollars and resources to places where the map indicators show extra help is needed. If you'd like to sponsor this work, or be part of it, introduce yourself with a comment, or connect with me on Twitter, LinkedIN or Facebook.